Fury is an interesting read and promises to be an excellent series. 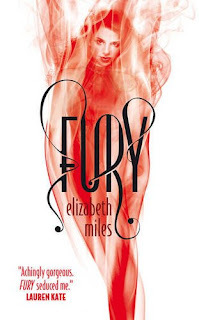 This book goes a long way to set up a number of things that could be teased out and used more fully in future books along with setting the scene of what the Furies are about and the type of people they go after. It is fast paced and engaging through out and keeps the reader guessing throughout the book. The thing that struck me first about this book is that the characters are not all that likable. They've all done things that are not all that nice and to a certain extent as a reader I started off with a slightly twisted satisfaction that they were getting what was coming to them as the Furies started their work. That said as the book went on and the ways in which the Furies got their revenge became more extreme I found myself ill at ease with what was happening. Had the book been a film there would have been several scenes where I would have been hid behind my pillow not quite wanting to look at what was going on. The author had this terribly clever way of writing where you were torn between not wanting to know what was going to happen next but also needing to know just as badly. For me the most interesting part of this story was the paranormal element which doesn't really come into play until the very end of the book and I hope this is something that is drawn out more fully in future books as I found myself with lots of questions about why they were doing what they were doing. All in all an interesting read and a potentially very exciting series for older YA readers. This sounds like such a great book I really can't wait to read it. I love the sound of the story but am a little concerned about the likability of the characters as that's a big thing for me. Thanks to your review I'll keep that in mind and now go into the book with an open mind. Sounds really exciting. I think I've been put off by the threat of unlikeable characters, but the story seems like it could be interesting enough that I should try to persevere with that. Maybe.